Anarchists, Socialists and Greens Rally to Defend Urewera "Terrorists"
On a cold and miserable day, the cries of "No More Police State!" 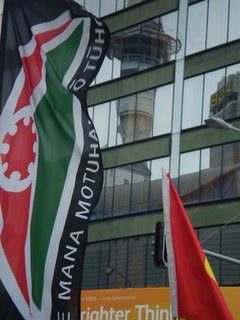 echoed through Central Auckland's Queen Street as over 200 Maori, trade unionists and left wingers joined a rally to defend the Urewewa 20, and remember the State Terror Raids of October 15th last year. The movement has previously been successful in forcing the State to drop the charges under the Terrorism Suppression Act, and now begins the campaign to drop all charges against the accused. The vocal launch of the campaign today brought many cheers and claps of support from Saturday shoppers on CBD streets, and signals the fact that the upcoming trials will be fought with a strident political campaign on the streets, and will unite people from many of Aotearoa's causes and communities. 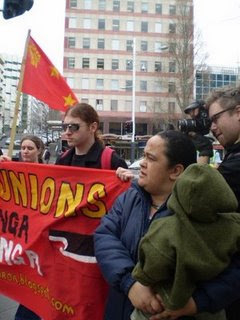 There were banners and contingents from Tuhoe, Unite, Socialist Aotearoa, the Workers Party, and Auckland's Anarcha-Feminist collective, with individuals from the NDU, Green Party and Maoridom. Keith Locke spoke about how angry he was that Tame Iti was being treated by the Labour Party as a terrorist and not as a leader of the Tuhoe people. Roger Fowler from RAM sang a song about Pastor Neimoller, and how all our civil rights are under attack when a State begins picking us off minority by minority. Omar Hamed, an arrestee well known and loved by the Auckland Left, told people of the events planned to build the campaign over the next week, including the forum this Tuesday Sept 2nd addressed by Tino activist Sina Brown-Davis, co-hosted by Socialist Aotearoa and the Auckland Anarchist Network. People left in high spirits, with the movement that began last October 15th re-ignited and ready to fight. Kia kaha!